Of any one hundred boys who become Scouts, it must be confessed that thirty will drop out in their first year. Perhaps, this may be regarded as a failure, but in later life all of these will remember that they had been Scouts and will speak well of the program. Each of the one hundred will learn something from Scouting. Almost all will develop hobbies that will add interest throughout the rest of their lives. Approximately one-half will serve in the military, and in varying degrees profit from their Scout training. At least one will use it to save another person's life and many will credit it with saving their own. 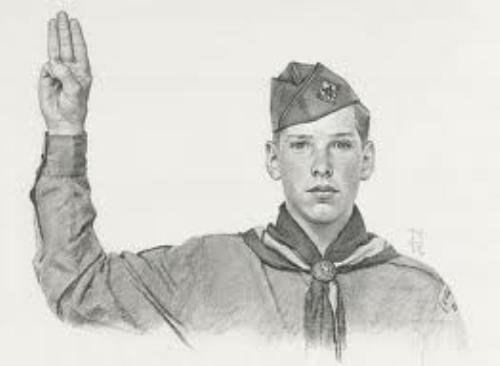 Only one in four boys in America will become Scouts, but it is interesting to know that of the leaders in this nation in business, religion and politics, three out of four were Scouts. This story will never end. Like the "Golden Pebble" of service dropped into the human sea it will continue to radiate in ever-widening circles, influencing the characters of men down through unending time.